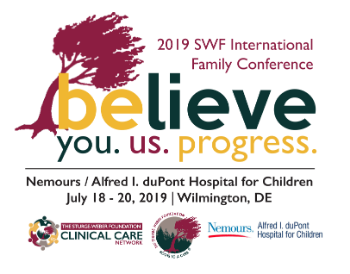 Welcome to the 2019 SWF International Conference Page! Thank you for your interest and visiting our website, we are excited you're here. The following pages will provide detailed information on this year's Family Conference, along with registration information and payment gateway. Please take your time and review all the information provided. For questions regarding conference details, please contact Julia Terrell, jterrell@sturge-weber.org. For questions regarding online registration or payment issues, contact Susan Finnell, sfinnell@sturge-weber.org. For: Patients and Family Members with a diagnosis of Sturge-Weber Syndrome or other Port Wine Birthmark (PWB) conditions. Hotel Accommodations: Sheraton Suites in Wilmington | 422 Delaware Avenue, Wilmington, DE 19801 - You must book your own hotel accommodations.